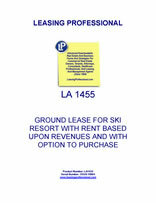 This lease is designed for the long term lease of a ski resort. Rent is based upon a percentage of the revenues from the resort. The tenant also has the right to purchase portions of the premises which the tenant improves with buildings or other improvements under the lease. 1. Landlord owns and leases certain land and other interests in real property located in _________ and _________ Counties, _________ more particularly described in Article I of this Lease known generally as the _________ Ski Resort. 2. Contemporaneously herewith, Landlord is selling all of Seller's assets constituting the _________ Ski Resort, except the property leased or subleased hereunder, to Tenant pursuant to a Purchase and Sale Agreement dated of even date herewith ("Purchase and Sale Agreement"). 3. Landlord desires to maintain its fee or leasehold interests in the leased premises described in Article I and lease the same to Tenant on a ground lease basis. 4. Landlord and Tenant desire to provide a mechanism whereby Landlord could sell to Tenant and Tenant could purchase from Landlord its fee interest in certain parcels within the leased premises for development by Tenant as more particularly described in Article XXV hereof. 1.01 Premises. Landlord hereby leases and lets to Tenant, and Tenant hereby takes and hires from Landlord, upon and subject to the terms, conditions, covenants and provisions hereof, all of the tracts, pieces and parcels of land, situated in _________ County, _________, more particularly described in Schedule A annexed hereto and made a part hereof, together with any and all appurtenances, rights, privileges and easements benefiting, belonging or pertaining thereto (all of the foregoing hereinafter sometimes referred to as the "demised premises", "leased premises" or the "premises"). 1.02 Lease Attributes. The leased premises consists of two different types of property interests, land owned in fee by Landlord ("Fee Land") and land leased by Landlord ("Leased Land"). The Fee Land and Leased Land are separately identified in Schedule A as such. This lease shall constitute a direct lease of all Fee Land and a sublease of all Leased Land, subject to the terms and conditions of the prime leases. 2.01 Initial Term. The initial term of this Lease shall commence on the date hereof (hereinafter referred to as the "Commencement Date") and shall continue for a period of Fifty (50) years. 2.02 Extended Term. Tenant may by right extend the term of this Lease on the same terms and conditions as provided herein for up to three (3) additional periods of fifty (50) years each by sending Landlord written notice of the exercise of each extension right not less than 12 months prior to expiration of the then current term, together with a payment of an extension fee of ____________ Dollars ($______) for each 50-year extension right exercised. Upon such receipt of the written notice and payment of the fee, the Lease term shall be automatically extended. 2.03 Grace Period. In the event Tenant fails to exercise an extension option pursuant to Section 2.02, Tenant shall not be deemed to have lost its right to exercise such option until thirty (30) days following written notice thereof from Landlord, during which period Tenant shall retain its right to exercise such extension option in accordance with Section 2.02 above. If no such notice shall have been given by Landlord prior to the expiration of the initial term or any extended term of this Lease (other than an expiration by virtue of the exercise by Landlord of its remedies pursuant to Article XVIII below), this Lease shall not terminate, but rather shall become a tenancy at will on the same terms and conditions set forth herein, subject to termination by Landlord after expiration of such thirty (30) days written notice to Tenant. (a) Tenant shall pay to Landlord the sum of four percent (4%) of Gross S&L Revenues, as hereinafter defined. Said sums shall be payable on or before September 15 of each year during the term of this Lease and shall be determined with reference to the Gross S&L Revenues actually received by Tenant for its preceding 12-month fiscal year ended July 31. Rent shall be prorated for any partial year included in the term. (ii) proceeds of sales of real property interests, with the term "sales" to include any lease of real estate for a term exceeding ten (10) years, that are conveyed to Tenant pursuant to Article XXV below. Gross S&L Revenues includes such revenues generated through operations of any business enterprises or person affiliated with Tenant. Affiliated parties shall mean any persons or business organizations that control, are controlled by, or are under common control with the Tenant, whether directly or indirectly through one or more intermediaries. Control shall mean the ability to control the management or operations of the person or organization whether through voting or capital interests or through any management contracts or other arrangements that provide for effective control. Gross S&L Revenues shall include any revenues or the value of any other consideration that are diverted from what is now known as the _________ Ski Resort operations to some other location or source within the Tenant's or any affiliated party's organization through establishing a contract, agreement or other business arrangement at what is now known as the _________ Ski Resort that is less favorable than would be established on an independent arm's length basis.